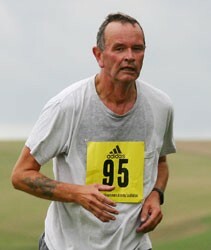 Next Wednesday I coach the first session of a new venture for my running club, Seaford Striders, a couch to 5k group. Based on the NHS Choices programme, I’ll lead a group through nine weeks of runs, increasing until we finally run for 30 minutes without stopping. Then we’ll go and do a parkrun. In other running news, this week I was off work, using up annual leave, which allowed for a post-Moyleman run on Monday, a short outing on Wednesday, a try-out of the first week’s Couch to 5k session on Friday, and a Twitten Run today. My next target, and that, I am delighted to be able to reveal, of the Moyleman race director and others of the organising committee, is the Seaford half-marathon, now eight weeks away. This is timely. My enthusiastic embrace of alcoholic drink since the Brighton half, and a diet of hot cross buns, mean that I have become portly again. Having spent the weekend preparing and marshalling so that others might run, it seemed only right that on a beautiful March day I should run myself. As I did, I tried to absorb the experiences of the 2017 Moyleman. From marking the course on Saturday, high above Firle in impenetrable fog, to the assembly at Wallands school and the address by Ash Head, Race Director, to the spectacular start on Landport Bottom, the race itself, my marshalling point at the top of Firle Bostal (which attracted a motley and fascinating band of supporters and interested passers-by), then down to follow the last runners through Firle and Glynde, and arriving at the finish in time to see the last four or five runners finish - it was an extraordinary day. I must record, too, that Mrs R brought her experience of time-keeping at sea in sailing regattas to bear on a land-based event, forming part of Tim’s Time Team. She says that it would be easier if runners carried large sails bearing their numbers. There’s too much to make sense of. To get a feel for the day, read Ash’s account, and that of Duncan, Assistant Race Director. This race has evolved, from what the computer wallahs call a proof of concept try-out in 2014, to full races in 2015, 2016 and yesterday, Each has been splendid, but today was the best yet, a worthy memorial for Chris Moyle. There’ll be photos and full results soon. As for the run, knee pain on tarmac, but better on the grass; then I passed the coastguard cottages and ran up the long hill from Hope Gap to Seaford Head, A large helicopter (a Chinook?) passed overhead. When it had gone, there was profound silence and solitude. I ran down Seaford Head towards home; halfway down a man stood, motionless, controlling a drone. A short plod this evening, in dreary mizzle. There’ll be little time for running this weekend. Tonight the organisers will soothe our nerves with the finest thrash-skiffle know to humanity, offered by the Curst Sons; tomorrow we mark the course. Then on Sunday we put on a 26-ish mile race around the Sussex downs. In forty eight hours time I will be toasting the success of the 2017 Moyleman. I’m organising a team of marshals, each of them giving up their Sunday to stand on the hills in uncertain weather, so that runners may tackle one of the hilliest, hardest races in southern England. If you want to understand the race, some of the course organisers (not me, you’ll note), ran the course in two legs: the first half, from Lewes to Southease, and the second, from Southease back to Lewes, by way of Firle and Glynde. Or feast your eyes on this elevation.